The company is accused of ignoring its own climate change science for years. View the original article at ThinkProgress. Exxon Mobil CEO Rex Tillerson said Wednesday the company backs a price on carbon and believes climate change brings “real” risks that require “serious” action. Speaking at the Oil & Money conference in London, Tillerson also noted that the Paris climate accord set to kick in this November is unlikely to limit near-term consumption of oil and gas, Climate Central reported. Tillerson’s comments come amidst accusations that Exxon Mobil, the world’s largest listed oil and gas company, for years ignored company scientists who warned about climate change as early as 1977. The company has also been accused of funding climate science denial groups. Since the story broke in 2015, multiple state attorneys general, led by New York AG Eric Schneiderman, and organizations have subpoenaed the company to give investigators 40 years of documents on research findings and communications about climate change. Exxon denies the accusations and has even sued some state AGs. On Monday, after almost a year of cooperating, the company sued in a Texas federal court to block the subpoenas from New York and Massachusetts, Inside Climate News reported. In a news release, Exxon called the New York and Massachusetts investigations “biased attempts to further a political agenda for financial gain.” The company said Schneiderman and others are colluding with anti-oil and gas activists. For more than decade “it has widely and publicly confirmed” the risk of climate change and its potential impacts on society and ecosystems, the company said in the news release. Organizations like the Union of Concerned Scientists (UCS) dispute that, however. 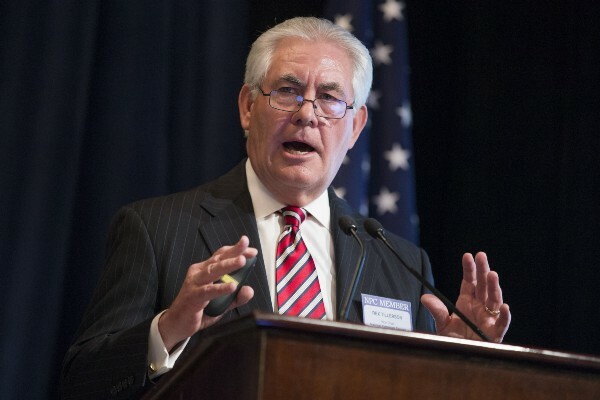 UCS claims that as recently as 2015, Tillerson said the world should improve its understanding of climate science before acting, and that he’s asserted climate models are inaccurate. The advocacy organization also notes Exxon is still associated with the American Legislative Exchange Council (ALEC), a free-market lobbying group that has worked to kill renewable energy programs, and teach climate denial in schools. “Integrity is in everything we do. It’s the foundation of trust and cooperation. A focus on integrity makes a corporations more effective,” he said.